Ships tomorrow if ordered in the next 2 hours and 6 minutes! Pile bread up with your favorite meat, cheese and veggies, and create a satisfying meal in one easy press. 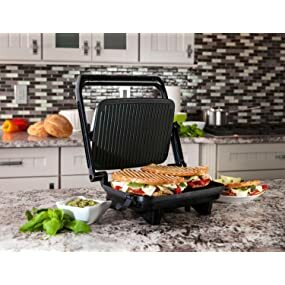 The Hamilton Beach Panini Press Gourmet Sandwich Maker Grill lets you grill hot, delicious sandwiches of any thickness, thanks to a floating lid that expertly presses down onto sandwiches and leaves appetizing grill marks behind. Hamilton Beach Panini Press Gourmet Sandwich Makers are perfect for anyone who needs a fast, easy meal that satisfies any taste. That’s the kind of versatility everyone needs in the kitchen. Review "Hamilton Beach 25460A Panini Press Gourmet Sandwich Maker "